Recently, air pollution legislations such as the Clean Air Act to reduce the amount of air pollution are increasing worldwide. The Clean Air Act address numerous air quality problems. One of these problems is acid rain caused by sulfur dioxide and nitrogen oxide emissions from fossil-fueled power plants and other industrial and transportation sources. Sulfur oxides and nitrogen oxides (NOx) are recognized as harmful pollutants and great efforts are underway to remove these toxic gases. Under emission regulatory requirements and legislation to reduce the emission of these air pollutants, power plants in particular have installed "flue gas desulfurization systems" also known as scrubbers. Wet flue gas desulfurization or scrubber systems are an excellent way of reducing the sulfur dioxide emissions caused by coal combustion boilers. The flue gas discharged from the boiler is fed into the absorber. In the absorber, a mixture of water and pulverized limestone is sprayed on the flue gas. The limestone slurry absorbs the sulfur dioxide (SO2) contained in the flue gas reducing the emission of sulfur. The limestone reacts with the SO2 to produce calcium sulfite. The calcium sulfite then reacts with oxygen and is then finally removed as gypsum. The limestone slurry and gypsum slurry are very abrasive. Magnetic flowmeters are normally used to measure and control the flow of the limestone slurry to the sprayers. Conventional style PTFE-lined magnetic flowmeters used in such applications normally have a short life expectancy, due to the abrasiveness of the slurry. The use of non-retained liners and electrodes that expose their seal to the process fluid/slurry make the meters prone to fail. Once the liner wears away or the seal around the electrode is eroded, the process fluid can then attack the meter's internals (coils and electrode wiring). Also, the use of electrodes that protrude into the process can create an increase in slurry noise as the limestone or gypsum collide with the electrode. In slurries, noise (voltage) is generated when solid substances collide with the electrode. Conventional electronics cannot distinguish the noise from the true flow signal and thus the flowmeter's output is erratic and the signal is not suitable for control purposes. If the flow rate is too high, greater than 2 m/sec (7 ft/sec), the limestone can cause increased wear on the liner. Should any of these conditions occur the life of the meter will be greatly decreased.Incorrect installation of the meter can also contribute to problems for magnetic flowmeters. In addition to the typical installation consideration for upstream and downstream straight runs, maintaining the velocity of the slurry within certain limits is also important. If the flow rate is too low, below 1.5 m/sec (5 ft/sec), the solids (limes tone) can fall out of suspension. In a horizontal line this can cause the bottom of the meter to wear out at an excessive rate. The ADMAG AXF magnetic flowmeter is an excellent choice for this application. Since Yokogawa uses a retained liner and an insertion style electrode that removes the sealing surface from the process fluid, service life is dramatically increased. The potential for slurry noise due to the limestone and gypsum colliding with the electrode is reduced due to ADMAG's flush electrode design. In addition, ADMAG's dual-frequency excitation and further optional enhanced dual frequency excitation provides a stable and more accurate measurement than conventional style meters due to its high frequency sampling rate and its ability to filter out slurry noise. An ideal installation for the measurement of a limestone slurry is to have the flow running up and to have the operating velocity between 1.5 to 3 m/sec (5 to 10 ft/sec). This keeps the limestone suspended in the water and the wear on the liner to a minimum. The use of a metal hat earth ring can also reduce erosion of the liner by protecting the leading edge of the liner. Where these installation recommendations cannot be met, a ceramic-lined meter should be considered. The ADMAG ceramic meter would be well suited for such applications due to the abrasion resistance of its liner and the reduction of slurry noise due to the flush and fused platinum electrode. Further the ADMAG CA, capacitance type magnetic flowmeter, which is ceramic lined and has no wetted electrodes provide ultimate solutions of abrasion resistant and immune to slurry noise. Some specifications of this product was discontinued. The AXF magnetic flow meter is a sophisticated product with outstanding reliability and ease of operation, developed on the basis of decades of field experience. Based on FOUNDATION™ fieldbus specifications, AXF Fieldbus Magnetic Flow meter models offer more flexible instrumentation. The ADMAG CA magnetic flow meter adopts a system to pick up the electromotive force generated in a fluid by electrodes provided outside a ceramic pipe through the capacitance of the pipe. In addition, the flowmeter employs a prominent high-frequency excitation method that reduces flow noise in low conductivity fluid. 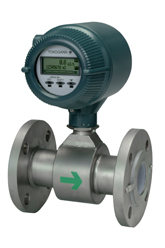 Yokogawa's experience with magnetic flowmeters spans decades. Our magnetic flow meters provide flexible configurations for industrial use in most areas.